Although we picked the best weather forecast out of the week for this hike, as is often the case, the mountains, and particularly Franconia Ridge, made their own weather. We spent the whole day in a damp fog, but nobody seemed to mind. Max was with us for a week, and because we knew he was a strong, seemingly tireless hiker, we were confident he could make this hike with us. He and Wicket did great on the trail together, and when we were done, I'm sure they could have kept going. So, off we went, quickly eating up the first 8/10ths of trail and bike path. There were some brilliant yellows and golds along this stretch and upstream as we crossed the bridge over the West Branch. We continued along, still moving at a good pace as we reached and began to ascend the relentless Liberty Springs Trail. It's a short route to the ridge, but in the Whites short also means steep, and we began the monotonous picking through and stepping over each rock and root on the steep terrain. The damp, foggy weather was not improving the mood of the hike, but we pushed on with thoughts of, "Well, we've been in worse." and, "If it starts raining, we're out of here!" But it didn't rain, and we had been in much worse, so on we trudged up a slope that reminds me of climbing a ladder. Max and Wicket were undaunted and pretty much continued to frolic up the trail as though they were on flat ground. As we rose up the mountain side and the deciduous trees gave way to conifers, we entered the fog that would encase us and limit any views to about 100'. After what seemed like forever, and long after I had to convince myself we had not already passed it and not noticed, we reached Liberty Springs Tentsite. I knew it was only 3/10ths to the ridge from there, and that gave me some new life. As we finally crested the ridge the weather was downright gloomy, and still, nobody seemed to mind. 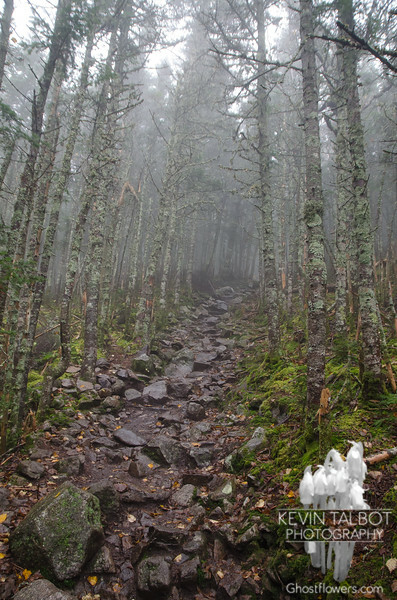 We turned south on the Franconia Ridge Trail and we were soon rising again through the forest. Soon the trail makes a steep scramble up onto a rock outcropping where in good weather one has a great view of the huge rock summit of Mount Liberty looming a few hundred yards ahead. As I stood and stared into the fog I could just barely make out a faint silhouette of its massive stone crown. As we crossed the last couple of hundred yards and scrambled up the rocky summit I was reminded again why we endure the steep, monotonous trail. Even in the dense fog and muffled silence there was a magic, electric connection to nature. We each chose a damp rock to sit on and have a damp lunch as damp dogs begged our damp sandwiches even though they had been fed their damp meals first. After our damp meal we continued along the damp trail, descending from the damp summit of Liberty, and forging on towards the equally damp summit of Mount Flume. There was a sketchy spot of wet rock just below the summit of Mount Liberty as we began to descend, and beyond there the trail continues to descend for what seems like forever before it finally levels off for a bit before beginning to climb towards the summit of Mount Flume. My mind keeps tapping me on the shoulder as we descend and saying, "You're going to have to climb back up this on the way back," and I keep telling my mind, "Bugger off!" We arrive at the summit of Flume which offers equally uninspiring views, but that same beautiful, smaller connection to the cosmos. I ate another sandwich, the dogs had some more, too. When we were done the dogs became very interested in smells that were drifting up from below us, and they stood on the cliffs edge staring into the fog sniffing for things we humans can only guess at. Eventually we heard voices approaching from the south and realized what had probably had the dogs attention. We soon turned north again and began the descent back down into the col between peaks before again rising up to the summit of Mount Liberty. The dogs still appeared to be starting out fresh, and we were soon back at the summit of Liberty. These two peaks had made #'s 34 Liberty and # 35 Flume, for Ms. Wicket. We wasted no time in beginning the descent from Liberty and back along the Franconia Ridge Trail to the junction with Liberty Springs again. The descent through rocks and roots was as monotonous as the earlier ascent had been. As we got back down low and descended into the deciduous trees we lost the fog, and moments of brilliant sunlight lit up the forest around us as the sun played peek a boo with the clouds. We reached the bike trail again and made short work of the 8/10ths back to the car. In the parking lot, sunlight lit up brilliant foliage as we peeled off our hiking boots and sank into the car. The dogs were more than happy to take a nap as we drove home.